At the 2014 San Diego Comic-Con (SDCC for short), Skybound Entertainment and Vannen team up to bring you a limited edition timepiece inspired by the hit Skybound/Image Comics series Manifest Destiny. Chris Dingess and Matthew Roberts' Manifest Destiny tells the "true" story of explorers Lewis and Clark as they embarked on their journey west to expand the United States, only in this tale, the duo do battle with monsters, creatures, and mythological horrors along the way. Manifest Destiny is the perfect comic series for fans of Robert Kirkman's The Walking Dead, and Vannen has designed a timepiece that beautifully captures the essence of what makes this terrifyingly fun series so special. 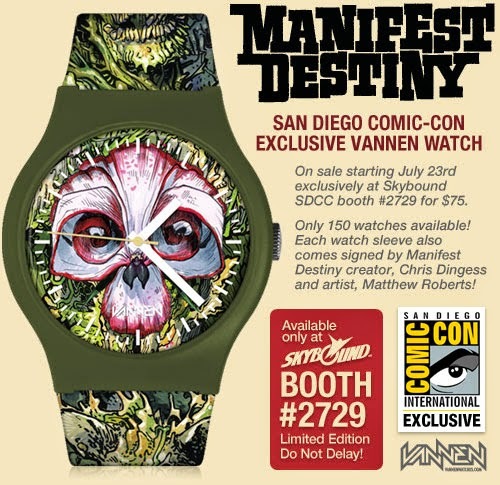 Vannen's limited edition Manifest Destiny San Diego Comic-Con exclusive watch features brilliant, full-color artwork by Manifest Destiny artist, Matthew Roberts and stylistically ties into the plant-based mayhem of he and Dingess' incredible series. The Vannen x Skybound Manifest Destiny watch is limited to only 150 pieces, retails for $75, and comes in collectible sleeves signed by creators Dingess and Roberts. 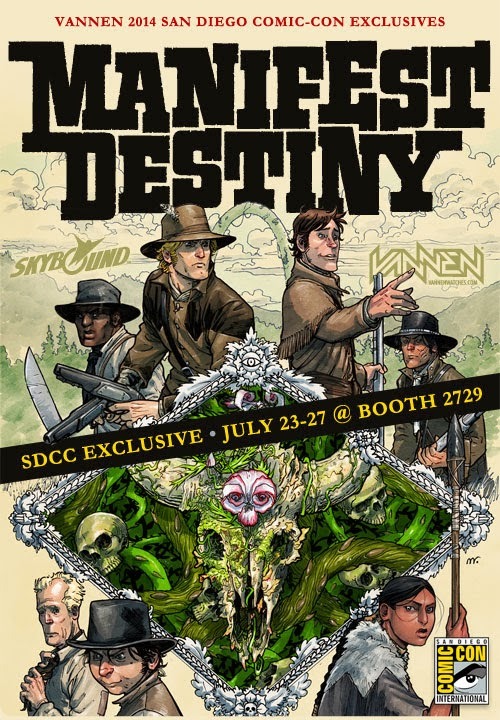 The Vannen x Skybound Manifest Destiny timepiece will debut exclusively during the 2014 San Diego Comic-Con at the Skybound booth (#2729) starting on Preview Night, Wednesday, July 23rd and will be available throughout the weekend while supplies last. For more photos and details about this killer watch, follow Vannen and Skybound at the links below. 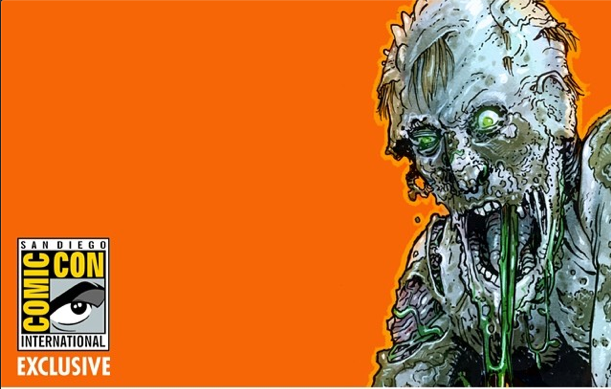 Skybound on Facebook, Twitter, and Instagram. 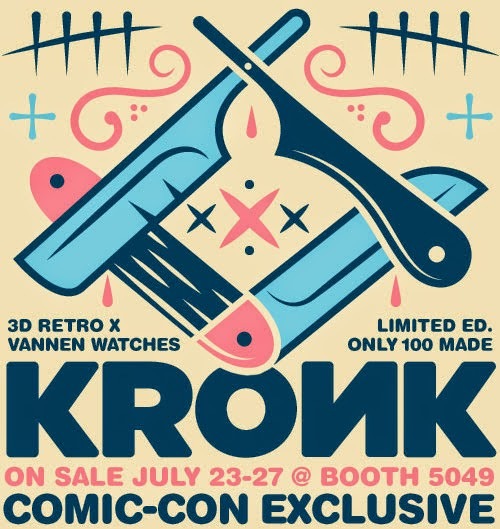 Vannen has also teamed up with 3D Retro for a limited edition artist watch exclusively available at Comic-Con. Designed by South Africa-based artist, KRONK, his watch is limited to 100 pieces and super-affordable at just $60. San Diego Comic-Con can put a dent in the ol' bank account, so we're keeping the price on this one low as possible. You can grab this one-of-a-kind deal only at the 3D Retro booth (#5049) starting Preview Night, July 23rd, and throughout the entire weekend. But only while supplies last! Stay tuned for more photos and surprises.